We believe in marriage, and we believe that God intended it to last forever. We invest so much time and effort and love into each other and our families - wouldn't it be a shame for all of that to simply end and become a memory at death? Well, it doesn't. God loves us and has a plan for us. That plan involves us being together with those we love forever - and it's possible because of Jesus Christ. We were married on August 22, 2008 in the Mt. Timpanogos Temple of The Church of Jesus Christ of Latter-Day Saints. While our wedding day was a bit of a blur, the ceremony itself was simple and beautiful. 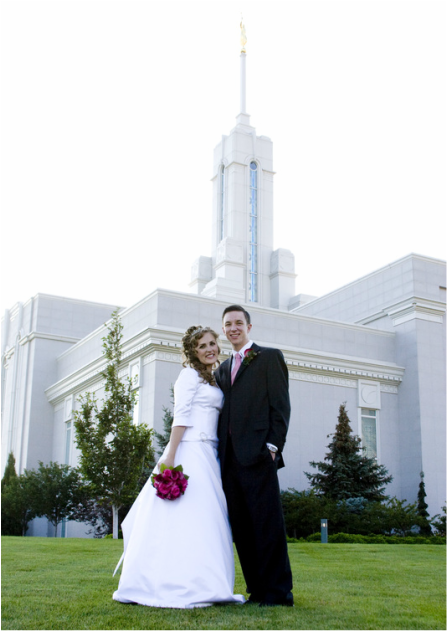 Something that is very special and significant to us, is what was said in our temple marriage. Rather than hearing the words "'Til death do us part," as is common in most weddings, we heard the words "For time and all eternity," meaning that our marriage can, and is intended to, last far beyond this life. We truly can be together forever! If you have any questions for us about our faith, feel free to reach out and contact us. We'd be happy to share more and answer any questions. You can also learn more here.